The research is ongoing at Plymouth University's ICCMR. 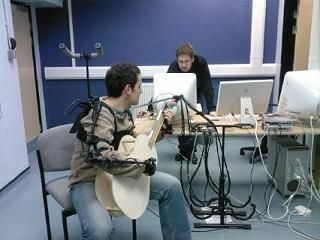 We´re familiar with the concept of virtual instrumentalists - this has manifested itself in products such as MusicLab´s RealStrat and Rayzoon´s Jamstix - but researchers at the Interdisciplinary Centre for Computer Music Research (ICCMR) at the University of Plymouth claim to have taken things a step further by developing a digital instrument that can listen to you (or anyone else) play and then jam along in a similar style. It sounds like the stuff of science fiction, but PhD student Marcelo Gimenes and Professor Eduardo Miranda seem to think that full-on musical cloning technology isn´t too far away. Their system ‘listens´ and learns (it doesn´t have to be pre-programmed) and is said to be much more sophisticated than previous efforts.